Biodiesel is a fuel derived from biological sources, with burning characteristics similar to those of diesel fuel distilled from petroleum (i.e., petrodiesel), and which mixes well with petrodiesel. The key difference is that biodiesel comes from agricultural crops and waste, not from oil wells, either foreign or domestics. It is also biodegradable, and less likely to produce engine fires. It is often referred to as a biofuel. Restaurant and food service waste vegetable oil (WVO) and trap grease (TG) can be converted to biodiesel (BD); 1 gallon of waste produces 1 gallon of BD in a cheap and clean process. It can also be made from a variety of biomass, such as appropriate algae. B100, which is pure biodiesel. B20 is unlikely to have any effect on current engines while there are recommended minor maintenance routines that should be used when an engine is "learning to drink" B100. This assumes, however, that the biodiesel meets the tests defined in American Society for Testing Materials specification ASTM D6571. Biodiesel is a more effective solvent than petrodiesel, which is both good and bad. When it is first used, it can dissolve deposits in the fuel tank and lines, which will be trapped by the fuel filter. Users may need to replace fuel filters more frequently when they first start to use biodiesel, but the cleaned engine will burn better. Some hose and gasket materials, especially in older engines, may be vulnerable to biodiesel; manufacturers provide guidance on this. Also, some older engine metals may accelerate the breakdown of biodiesel, but, when it is consumed quickly, this is not a major concern. Biodiesel mixing with lubricating oil can create problems; oil levels need to be checked daily. The amount of fuel in the oil should be tested periodically, as well as spot-tested for biodiesel percentage -- the percentage will be constant if the producer does aggressive chemical monitoring. In no instance should the fuel dilution of the oil be allowed to exceed 5 percent. Tanks should be kept as full as possible to minimize condensation because water accelerates microbial growth. New fuel filters should be installed when biodiesel is introduced to older or used engines. For the first two changes, the fuel filter life will be half the standard. Some engine manufacturers recommend detergent additives for biodiesel. Compared to conventional petroleum diesel fuel, B20 will result in slight reductions in power and fuel economy. Biodiesel can reduce water separator efficiency. Biodiesel can cause cold weather flow degradation. To ensure a stable product, a quality B20 should be used within 90 days of the date of biodiesel manufacture because biodiesel is biodegradable. Storage tanks should be protected from direct sun, frost, and other extremes of temperature. Acceptable storage tank materials include aluminium, steel, fluorinated polyethylene, fluorinated polypropylene, Teflon®, and most fiberglass. Sedimentation and water should be removed on a routine basis. Ideally, in a renewable fuel system, no more biodiesel should be made than can be consumed within 90 days. Feedstocks are more stable than the biodiesel. Besides replacing petroleum, biodiesel also is more environmentally friendly than petrodiesel. Biodiesel is the only alternative fuel to have fully completed the health effects testing requirements of the Clean Air Act. The use of biodiesel in a conventional diesel engine results in substantial reduction of unburned hydrocarbons, carbon monoxide, and particulate matter compared to emissions from diesel fuel. In addition, the exhaust emissions of sulfur oxides and sulfates (major components of acid rain) from biodiesel are essentially eliminated compared to diesel. Of the major exhaust pollutants, both unburned hydrocarbons and nitrogen oxides are ozone or smog forming precursors. The use of biodiesel results in a substantial reduction of unburned hydrocarbons. Emissions of nitrogen oxides are either slightly reduced or slightly increased depending on the duty cycle of the engine and testing methods used. Based on engine testing, using the most stringent emissions testing protocols required by the U.S. Environmental Protection Agency for certification of fuels or fuel additives in the US, the overall ozone forming potential of the speciated hydrocarbon emissions from biodiesel was nearly 50 percent less than that measured for diesel fuel. A 1998 biodiesel lifecycle study, jointly sponsored by the US Department of Energy and the US Department of Agriculture, concluded biodiesel reduces net carbon dioxide emissions by 78 percent compared to petroleum diesel. This is due to biodiesel’s closed carbon cycle. The CO2 released into the atmosphere when biodiesel is burned is recycled by growing plants, which are later processed into fuel. Biodiesel exhaust has a less harmful impact on human health than petroleum diesel fuel. Biodiesel emissions have decreased levels of polycyclic aromatic hydrocarbons (PAH) and nitrited PAH compounds that have been identified as potential cancer causing compounds. The basic biodiesel synthesis reacts clean, dewatered oil with methanol in the presence of potassium hydroxide, at 50 degrees Celsius. Assuming waste vegetable oil feedstock, the product is filtered to remove food particles and other waste. Such filtering may be done through settling in a receiving tank; the receiving tank and plumbing, in any case, must be capable of handling suspended solids and being cleaned of them. Solids removal: Either vacuum filtering or centrifugation is used to remove non-oil solids in the WVO..
Dewatering: Water levels should be measured for our planning, probably by centrifugation of a sample. Water needs to be removed by heating to approximately 120 degrees Celsius to let the water boil off, centrifugation, or use of a drying agent. There are several tradeoffs for the means of heating, and conceivably a role for solar heat. Note that the boiling will produce pressure, and there must be both expansion space in the container and a vent for water vapor and steam. By using an acid reaction step before the biodiesel generation step of transesterification, the overall process becomes far more tolerant to variations in the free fatty acid (FFA) content in the WVO. WVO biodiesel programs have had problems with not being able to use individual batches of WVO because the FFA is slightly too high. Esterification makes the process tolerant to extremely high FFA concentrations, as might be found in trap grease, not just overused WVO. Esterification will speed transesterification and increase yield. This is the core process, in which preprocessed WVO is mixed with methanol, in the presence of potassium hydroxide, to produce biodiesel and glycerin. The reactants are heated to approximately 50 degrees Celsius, and the reactor vessel and vents must allow for expansion. Vapors arising from the heated reactor usually contain methanol, which can be condensed and reused. In an alkali process, the calculated volume of the base (sodium or potassium hydroxide) The amount of biodiesel produced is roughly that of the pure fats in the WVO, with the alcohol converted to glycerin. After transesterification, the mixture will contain biodiesel, excess alcohol, and glycerin. 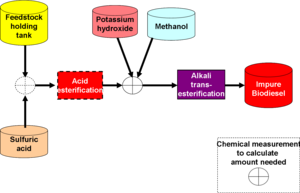 With ethanol more than methanol, the biodiesel and alcohol may be in an emulsion, which can be broken into its components by standing, centrifugation, or the addition of a low-boiling nonpolar solvent. There are several ways to dispose of glycerin. Possibly with some purification, it can be used in composting and soapmaking. In some plants, it can be burned for heating fuel. It also may be treated to make it into feedstock. Again, the excess alcohol should be captured and reused. Excess alcohol can also be removed by washing with water, distilling off the alcohol, and distilling the water or absorbing the water with a drying agent. If B20 is the product, it should be mixed with petrodiesel and any appropriate additives at the plant, so the incoming temperatures can be controlled as well as agitation. This step may be preceded by quality control tests on the petrodiesel. Provision needs to be made to draw off condensed water and solids, before going into the delivery truck. The truck pump will have a final filter. This page was last modified 10:52, 30 October 2013.